I have a love hate relationship with movie adaptations of books. Whenever I hear a new movie/TV show coming out is based on a book, I must immediately read said book, watch said movie/TV show, and proceed to point out all of the ways in which it differed from the book. How the characters look NOTHING like how I imagined (or EXACTLY as I imagined), and generally drive whatever poor soul is watching the film adaptation with me insane. Don't get me wrong- I generally end up enjoying the film version too, but I of course have to point out the minutia of differences between the two. 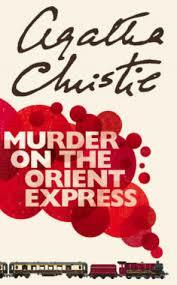 Which brings me to this weeks read, Murder on the Orient Express. When I saw it was being made into a movie, of course I had to read it so that I could watch the movie and dish ad nauseum on the similarities and differences to the book. Brief synopsis shall we? A man is murdered on an overnight train across Europe. Stabbed a dozen times and locked in his room bolted from the inside with a chain drawn across the door, the case is both intriguing and perplexing to Hercule Poirot, passenger and fortunately international detective. At the behest of his friend, and owner of the rail company, Poirot investigates the crime, interviewing the passengers on the train and examining evidence. When the train is held up, in the middle of nowhere, due to a snow drift barricading the tracks, there is nowhere for the killer(s) to hid. Someone on the Orient Express is guilty, but who? This book was not what I was expecting, in the best of ways. It was insanely detailed and methodically planned out. It was like a grown up Nancy Drew meets Clue mystery. Each character was unique and interesting, well fleshed out to the minds eye. There were quite a lot of them to keep up with (over a dozen), but Christie does a good job of providing the reader with reminders about who each character was and how they were interconnected to the others on board. The ending was not what I was expecting, which is always fantastic in a mystery. Overall, it was a really great read, one that I am sad I hadn't read earlier! Now (of course) I need to tell you how the movie compared right? There were some minor differences (characters changed ethnicity and appearances weren't quite as I had imagined) which I felt there was really no need for, and a few major changes which I felt there was absolutely no need for. It was certainly frustrating to say the least. I will say, the casting for Poirot was spot on, he carried the movie effortlessly. Overall it was kind of a disappointment but hey, at least they had great popcorn!